Adi Kukun speaks with a man responsible for the killings of many in "The Look of Silence." Photo courtesy of Participant Media. WHEN the final credits roll, a good deal of them anonymous, one can't but shake one's head. The audacity of humankind, the sheer chutzpah. 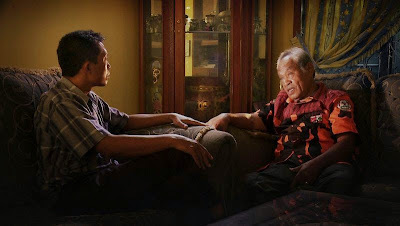 In “The Look of Silence,” Joshua Oppenheimer's companion piece to the Oscar-nominated “The Act of Killing,” Adi Kukun speaks with some of the people responsible for the killing of his brother and around a million others during a communist purge in 1960s Indonesia. The documentary has its U.S. premiere today at The 52nd New York Film Festival. Perpetrators in “The Look of Silence” recount with glee their exploits to AK's face and to JO's camera. One man drank the blood of his victims. Another recounts slitting throats. Yet another remembers fondly how they cut off penises. It is as riveting as it is disgusting. (See video below of JO in Venice, explaining how he filmed). At the time the military, a regime that is still in power, overthrew the government and denounced the opposition as communists, using that excuse to kill indiscriminately. When the perpetrators and/or their families learn the identity of AK, most deny, claim ignorance or try to justify. It is a sad, sorry business. One woman, the daughter of the “vampire,” is shocked, shamed to learn of her father's atrocity. She apologizes. Perhaps, like the Oscar recognition of “The Act of Killing,” a sign that a reckoning may yet come. An opportunity for those who perpetrated and those who witnessed a national crime to speak freely. In another word, a reconciliation. Dominik Graf's drama, in its North American premiere today, is based on the relationship between German poet Friedrich Schiller and the von Lengefeld sisters, Charlotte and Caroline. (See video below). Indeed, it is a love story or a story about the power of love, this gorgeous, set piece with the German landscape as its backdrop. One that would fit perfectly on “Masterpiece Theatre” if it weren't on the large screen. At nearly three hours, not one boring moment. “Beloved Sisters” is a delicacy, every morsel of which is a little orgasmic.